In this blog I want to show you the way of getting user-defined parameters within XSL transformation without using any custom java classes and Dynamic Configuration. But first, I would like to thank Nikolay Yasinskiy very much, whos valuable suggestion threw the light on how the Operation mapping input parameters can be accessed directly using java extensions mechanism. Described approach is based on using poorly documented input parameter “TransformationInput”, which is passed to XSL transformation among the other parameters. At next step we just get parameter value using java extensions mechanism and types casting possibilities. As you can see, neither custom java classes nor Dynamic Configuration as transport layer were involved. Now we can define the needed parameters in Operation mapping editor and bind it to respective XSL mapping. That’s all. Thanks Evgeniy for providing simplified approach. Quickly tested on my system and it works fine. Are these parameters ‘inputParameter’ or ‘TransformationInput’ predefined parameters which SAP PI operation mapping recognizes ? what if I defined a parameters whose name is of my choce ? These are the parameters (actually, java class instances) which are passed to any mapping program by mapping runtime. When you define the parameter in Operation mapping, its name and actual value are added to InputParameters map before mapping program executing. 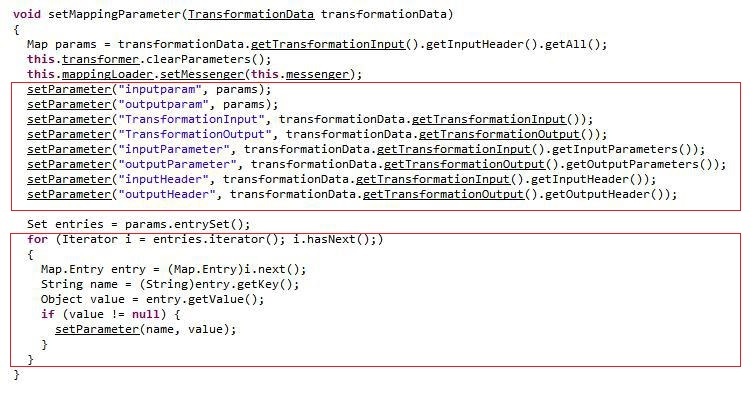 If you have ever used java mapping classes, you would use the interface AbstractTransformation and its method transform(TransformationInput in, TransformationOutput out). Using this method’s parameters we can get access to InputParameters, OutputParameters, InputHeader, OutputHeader and so on, using respective getter and setter methods. Okay, I understand. The Java code which you have posted as image, where have to taken it from ? PI internal ? So it is basically the map names like inputparam, TransformationInput, inputParameter and inputHeader. The mapping runtime sets all these map names. Yes, provided Java code was taken from internal classes used by mapping runtime. Frankly speaking, I’m not aware about the reasons why the mapping parameters are passed this way, for example, why the contents of InputHeader are passed again like separate parameters along with InputHeader itself. I guess there must be some reason for it, for example, if one uses external XSLT transformer – he wouldn’t be able to use java extensions or casting. I was looking for such “clean” solution for some time. I have just implemented it in my WebService scenario for parametrization and it works like a dream. Thanks for sharing this approach which utilizes knowledge of how the internal PI classes work. It is a really valuable contribution to the community. I happen to have one such development few months back, and if only this was available back then, I wouldn’t have had to go through the whole Dynamic Configuration and additional Java helper class. Thank you very much for this feedback!